It was over 100F, humid, and harsh for the 'Tomorrow Never Dies' cast and crew in Bangkok, Thailand. The location was to double for Saigon, Vietnam, in the movie, with 007's escape from Elliot Carver's skyscraper and the ensuing motorcycle chase the two key scenes to be filmed in the city. At the mid-production press conference, held on 15th May 1997, Pierce Brosnan announces that the experience so far in Bangkok has been "very colourful and very hot." He might not have been talking about the weather. The 43rd floor of the Sinn Sathon Building must have felt like a world away from the hustle and bustle in the streets below for the start of the banner leap. But if the temperatures and traffic weren't enough to fray the nerves of the production team, the long hours and media reports of friction between director Roger Spottiswoode and writer Bruce Fierstein (who was on location often re-writing pages the morning before a shoot) almost brought the experience to boiling point. 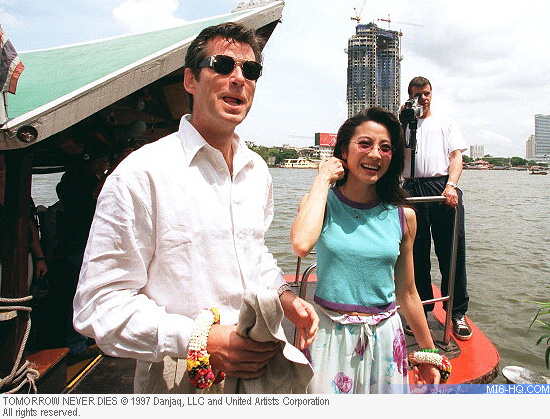 Pierce Brosnan and Michelle Yeoh in Bangkok on May 15th, 1997 on their way to a mid-production press conference. The Daily Mail reported that Spottiswoode and Feirstein were no longer on speaking terms and that crew members had threatened to resign, with one saying "all the happiness and teamwork which is the hallmark of Bond has disappeared completely." This was denied by Brosnan who claimed "it was nothing more than good old creative argy-bargy", with Spottiswoode saying "it has all been made up...Nothing important really went wrong." Whilst action moved to the motorcycle chase, Feirstein was holed up in the nearby air-conditioned Shangri La Hotel, hastily rewriting scenes in the endless battle to perfect a script that already had half of the action in the can, a fixed shooting schedule, and sets built. By September 17th, production finally wrapped. By all accounts, the shoot was the most grueling and tension strung in many years. Brosnan later said that production of this film was "like pulling teeth".